So what do you do when you’re out and about shopping in the city centre and you get hungry but want something nutritious or have a particular food allergy/diet yet all you can see around you are burger joints & the typical coffee house? First up is the local health food store, this small but lovely shop has all sorts of products and ingredients for the health food lover and also does speciality food such as vegan sandwiches, vegetable samosas, treats such as chocolate peanut butter balls, muffins, fifteens with most being gluten & dairy free. They also sell a few refrigerated products that you can take with you to eat on the go like coconut/soy yogurts and kefir. This is also where I get my spelt pasta from, which I love! This place for food is only available Fri-Sun and can be very tempting in regards to the more unhealthy food but if you make a bee line for the right stalls then it can be amazing. There’s lovely organic fruit & veg stalls where you can grab yourself some organic fruit to snack on as well as food for your week’s dinners but also smoothie/juice stands too with one that uses only organic ingredients. 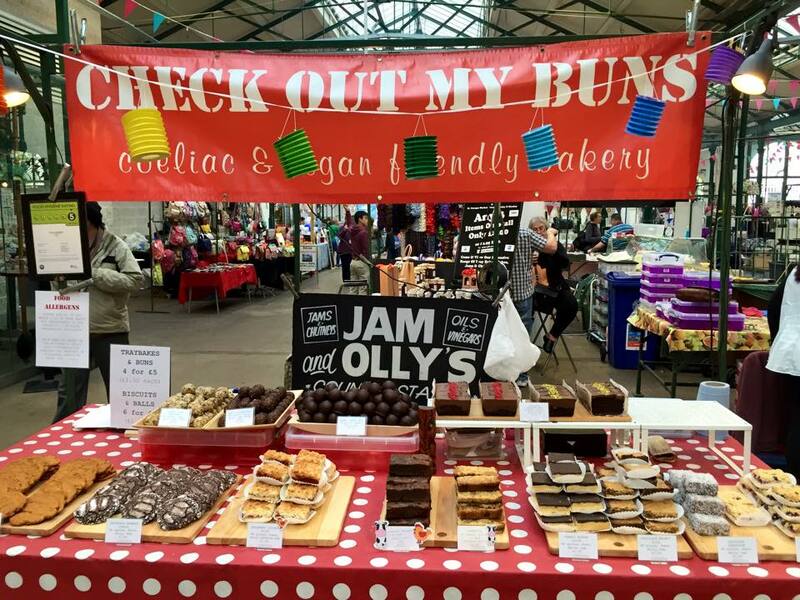 If you’re needing something more substantial or have food allergies then there is a lovely “Check out my buns” stall that sells delicious allergy specific treats. My personal favourites are the choco peanut butter slices/balls or ginger & almond slices but it also boasts a variety of cookies, energy balls, courgette cake, berry oat slices and more! Again, the products are gluten, dairy & egg free or 2 out of the 3. Similar stands also sell a mix of savoury & sweet products specialising in being gluten free with food such as sausage rolls, brownies, scones etc. The choc salted caramel slice I got from C.O.M.B for my birthday! This smoothie bar of course does the usual orders of smoothies/juices but now also offers things like juice shots which you wouldn’t find easily elsewhere in Belfast, I always thought I’d have to go to London for this kind of thing! You can choose from wheatgrass or turmeric/ginger. The turmeric shot tends to be mixed with some juiced ginger which is actually great as this helps the absorption of the turmeric which is awesome! This shop can be a little bit more expensive than the others but does have a great deal of variety & supports local produce. Here they sell lovely local Irish oatcakes, cheeses, fish, a huge range of teas and spices with one of the most impressive products being their frozen meat products such as ostrich burgers etc. A great place to find a gift for any food lovers in your life. What was once RFR is now under new management and called The Honest Vegan, as of yet I have not been to the new place therefore cannot give a review here, so for now i’ll just leave you with pics from my lovely lunch that I got from Raw. I adore this place and the ethos behind it which comes from the health conscious owners, one is a nutritionist, the other a personal trainer and food consultant. They celebrate all things healthy and delicious and each week they have me drooling over their pancake stacks on Facebook. The menu is quite varied with something for everyone, there’s egg and meat options e.g. turkey sausage, free range chicken etc but also vegan and low carb options too. This is my almond & coconut flour low carb pancakes with sriracha sauce and turkey sausage, I have also previously had sweet potato waffles with smashed avo and sriracha (it’s a mild one btw). Their selection of bliss balls are also extremely tempting so you’ll more than likely end up going home with some of them in your pocket whether you planned to or not! They are also doing nicecream popsicles now using Linwoods hemp protein mixes which I’ve been lucky enough to try & can say they’re a properly delicious, nourish treat. Strawberry nicecream on waffles with hot cacao sauce-drool! These guys know how to make a mexican tostados! They make everything from scratch including their tacos and their salsa is amazing! The tacos are gluten free and naturally lower carb plus they do awesome refried bean and guac vegan options which taste divine and salsas to suit everyone whether you like it hot or mild, give them a visit and show them some support as they’re out there Mon-Sat in their van even when it’s darn cold outside, so major kudos to them! This place is great because it is like a salad pick n mix. They also do sandwiches, wraps and soup as well as a ton of salads. You can build your own bowl and have it “chopped” by great big scythe like instruments or choose one from their board which has already been thought out, they also have a very broad range of sauces/dressings to complement your choice. For the price you pay, you really do get quite a generous sized bowl which you could take home with you if you didn’t finish it all and another plus is that they use recycled material for their bowls and cutlery making them quite eco friendly, big thumbs up there!